Metal 3D printing, although it has gone down in cost, is still quite expensive. This limits access to the technology for small and medium-sized businesses, meaning that many applications go untried. In a paper entitled “Design and Development of a Low-Cost 3D Metal Printer,” a group of researchers discuss how they created a low-cost metal 3D printer that utilizes metal inert gas (MIG) welding and an open source microcontroller to fabricate parts. The researchers took the design of their 3D printer from a Prusa i3 system and used several off-the-shelf components to build it. “The components consist in developing 3D metal printer machine are; a pair of bearing holder and motor bracket, motor casing, shaft holder, ball screw, coupling, limit switch, linear bearing, stepper motor, polyurethane cylinder, polytetrafluorethylane (PTFE) plastic cylinder and various fastener,” they explain. A MIG welding machine was used to supply the material and the energy to melt the material. The movement of the printer and the translation of command from the printer’s server to the host computer was controlled by firmware provided with an Arduino microcontroller. The cost of the entire system was about RM 3496, which translates to roughly $840, much more affordable than a typical metal 3D printer. The MIG welding machine begins building a part layer by layer, from bottom to top. In order to test the system, the researchers performed two experiments in which a cylinder and a rectangle were 3D printed. 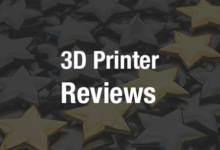 Five samples were 3D printed for the first experiment and their average values were recorded. They found that porosity occurred when voltage was either to high or too low, and that higher voltages reduce the size of the specimen due to the excessive flow of the molten metal. A voltage setting of 20.5V produced a good quality part, but it was not dimensionally accurate. In the second experiment, the researchers attempted to find the best printing speed. A too-slow speed resulted in a rough surface and poor fusion. They found that the speed should not be any higher than 20mm/s, however, so that the liquid had time to solidify. Post-processing was required in all cases to get better surface finish. As you can see the results are far from perfect but at this price point many would be able to try to improve such systems. Given more time and investment this could very well be a viable alternative to some metal parts. Authors of the paper include N.A. Rosli, M.R. Alkahari, F.R. Ramli, S. Maidin, M.N. Sudin, S. Subramoniam and T. Furumoto.